We are the leading manufacturer and supplier of Tower Bolts. 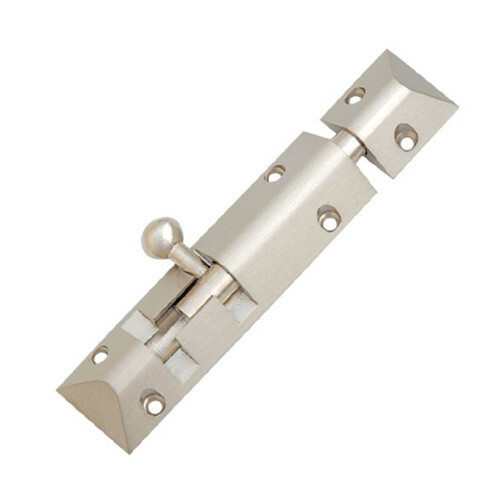 These products are perfectly suitable for all the bolting requirements in windows and doors. Fabricated using latest machines and tools, the range is the first choice of our esteemed clients. We are a trader of specialty hardware, glass and complementary products - An agent for change in a dynamic and creative industry. Our customers – More than 700 customers nationwide, of which over 500 customers are in the NCR region itself. Our product – Over 10,000 products (SKUs) in a wide variety of categories including: hardware, glass and building decorative and functional hardware, closet storage solutions, sliding door systems, decorative and functional panels and laminated glass products. This offering is complemented by the specialty items manufactured by dorma+kaba, a leading global player having a long tradition of innovation and engineering skill. Our wide array of products, our “one-stop shop” service approach, our logistical efficiency and the numerous advantages of the transactional website, translate in to an optimal response rate for our customers. At the forefront of e-commerce – We maintain a network of value-added transactional websites targeting customers in multiple markets.